New Delhi : Come June, the most anticipated news in India is the arrival of monsoons and the promise it holds for the country’s 119 million farmers and 144 million agricultural laborers directly involved with agriculture. The impact of a good monsoon could be felt in the collective sigh of relief heard, when IMD improved their long-range forecast for this year to 98% and ruled out El Nino possibilities altogether. With the monsoon going well, we may have a bumper production year in 2017-18, on the heels of a good 2016-17. In 2016, India produced its largest ever cereal food grain estimated at 273 million tonnes. We also saw bumper production in pulses, sugarcane and cotton. 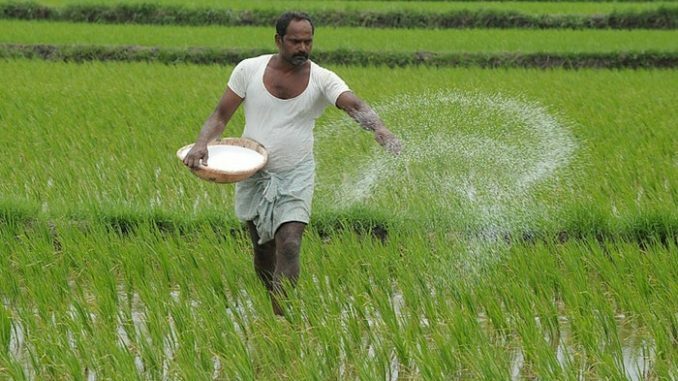 Agricultural budgets have gone up from Rs 16,646 cr to Rs 41,855 crore in the last 3 years. And the government has introduced many agro-centric initiatives like Pradhan Mantri Fasal Bima Yojana, Soil health cards, Pradhan Mantri Krishi Sinchayee Yojana and National Agriculture Market (eNAM). Minimum Support Price (MSP) for different crops have also been enhanced regularly. Our Prime Minister also pledged to double farmers’ incomes by 2022 and this certainly makes for a rosy picture. Despite this positive outlook, we recently saw intensive agitations across states. While farmers may have genuine reasons to protest and demand government support, often these protests are perceived as lawlessness by general public. We must remember though, that farming is indeed a tough job with earnings that hardly measure up to the hard work and toil involved. In fact, annual earnings of a 3-acre farmer are much lower than an IT sector or corporate newbie. For Indian farmers, this boils down to survival each season. Today food production is not the trigger for an agricultural crisis. Global and local market volatility is the current bane. Global explosion in food grain production has changed the market dynamics leading to pressure prices on our produce. While produce prices are constantly under pressure, costs are rising everyday thereby impacting farmer’s incomes, debt repayment capacity and their overall wellbeing. Making matters worse, farmers bear the entire risk in the farm to market cycle. Be it outbreak of pests at production or losses in storage & transport or price uncertainty while marketing, the risk is not distributed evenly amongst other stakeholders like grain traders, aggregators or processors. 1) Minimizing the risk for farmers and distributing it equitably across the agro-value chain. 2) Ensuring a fair share of the value that is generated at the end consumer level reaches the farmer. 1. Weak Producer – Consumer Linkages: there is a disconnect amongst what the Indian farmer produces and what the consumer demands. The farmer is not connected to aggregators, food processors and retail chains to help shape the nature of his produce. As a result, produce remains the same annually, largely dependent on farmers and is often driven by the government’s MSP program. 2. Weak Supplier Power: The farmer is barely empowered as a supplier. He continues to be small & marginal, inadequately resourced, ill-informed on markets and marketing, ill-equipped to manage risk, burdened with credit & debts and is dependent on traders to reach the buyers. 3. Overdependence on Agriculture: 60% of the Indian population depends on agriculture for livelihood while contribution to the national GDP through agriculture is only 14-15%. Clearly this is a recipe for unsustainable development. 4. Technology Starved: The farmer is not equipped with the latest technology nor trained to adopt it fast. Lack of new technology solutions keeps the farmer from gaining an equal footing globally. Also, they have little control over driving development and change due to the involvement of multiple pressure groups such as environmentalists. 5. Commercial Agriculture vs Subsistence Agriculture: Policy frameworks across different crops remain the same and do not enable any significant impact. Whether they are basic food grains, pulses and oilseeds that meet staple dietary requirements and food security needs of the country or commercial crops like cotton, sugarcane, chilies that feed into industries that produce consumable goods or even vegetables and fruits for domestic consumption or export crops – the same broad stroke policy measures are used across each segment. 6. Low investment in Research & Development: Less than 1% of the Agricultural GDP in India is spent on research. That is abysmal considering this sector is critical to food security of the country and provides livelihood to 60% of our population. 7. Lack of enabling infrastructure along the value chain: There is a staggering lack of infrastructure across the entire agricultural value chain. To make matters worse, a perspective on how this can be fixed also does not exist. A long term strategic vision which puts in place a holistic framework is the need of the hour. Key areas that need to be addressed include ‘Increasing Supplier Power’, the ‘Producer – Consumer Linkages’ and ‘Customized Approach to Different Crop Groups’. These areas enabled with quality infrastructure, education, R&D, technology, marketing and risk mitigation etc. will give us the agricultural empowerment we need. a) Large Farmer Producer Organizations (FPOs)While there are some successful FPOs currently running, sustainability of operations in FPOs is still a question. What can help is ensuring that FPOs are properly networked and federated, regionally as well as centrally. b) Encourage Land Banks wherever possible, especially hills and semi-arid areas where farming is difficult. This may be more feasible in areas where fruits are grown. Individual farmers can form large land banks by depositing their land into a large pool and then cultivate as one body in a professional manner on predetermined price and other terms. This could be a partnership model between producer-supplier bodies on one hand and aggregators, retail chains, food processors, another buyer on the other hand making them a stakeholder in the bank. 2. A comprehensive vision document to promote and establish direct linkages between growers and consumers: A policy framework that promotes structured, direct linkages between professional aggregators, food chain collaborators, food processors with large FPOs/Land Banks will reduce uncertainties drastically. This will ensure a fair share of the value created at the terminal end insuring the farmer from concentrated risk. 3. Roadmap that establishes a distinctive and customized policy approach for different crop groups. Each crop group comes with its own set of distinct challenges. For instance, increasing export crop production requires a different mindset and policy prerogatives compared to basic food crops or other commercial crops. As a nation, we need to move from an ‘Export what is Grown’ ideology to ‘Grow per international quality standards & Export’. Measures such as establishing Agro Export Zones that have an independent APEDA equivalent as an enabler will be key. A customized approach and policy framework is needed for each crop segment such as food crops, commercial crops and vegetable growing regions. 4. Advance technology adoption throughout the agro-value chain. Rapid technology upgradation to global standards need to be viewed as a top priority. Keeping current realities in mind, a complete overhaul of education in Agri Universities and research in scientific institutions need to be considered. R&D investments and capabilities in the sector must be enhanced substantially while bringing in transparency and accountability. 5. State of the art infrastructure in areas like storage & transportation, knowledge & information, credit & insurance etc. needs to be established. 6. And lastly, a clear plan to reduce dependence on agriculture from an untenable 60% to a more sustainable 30%. Agricultural policies would do well to address the need to make agriculture more efficient and less burdened. Also, enabling supporting professions for people looking for alternate careers would go a long way. A revolution of the Indian agricultural sector is what the country is calling out for today. Not short-term fixes, but a long-term, strategic, sustainable vision based on the realities of 2017. Agreed, it is easier said than done. But if we can send space probes to Mars at first go, this should not be such a big deal after all, right?